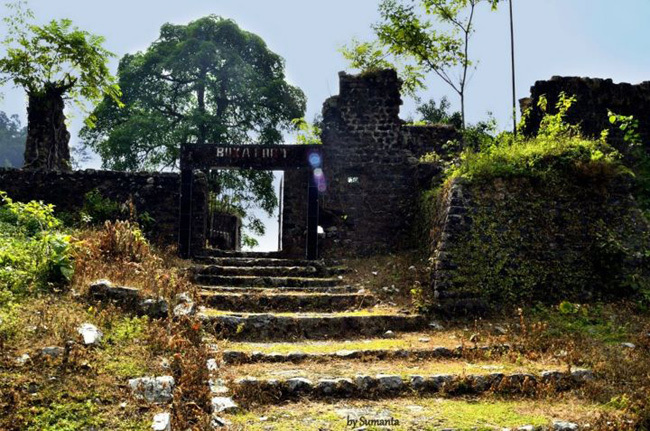 One of the most famous princely states of the Royal India, Coochbehar still carries the remnants of its past. A well architected city, it has a great history behind it and beautiful greenery surrounding it. The history of Coochbehar dates back to the period of the Pala and Sena of the 11th and 12th century AD. The territories of Coochbehar and Bhutan were part of the great Kingdom of Kamrup. When this kingdom broke up, many petty principalities were born and a fresh kingdom was built by the Koches. Till then this state was known as Kamta. It was during the period of Maharaja Viswa Singh and his son Maharaja Naranarayan that the name was changed to Coochbehar meaning, where the Koch people dwell. The present Maharani of Jaipur, Gayatri Devi was the princess of this princely state.<br />The city centers around a huge beautiful lake called the Sagar Dighi and the administrative blocks surround this old structure. The city was specially designed with well laid roads and lakes by a French architect in the mid 19th century and is perhaps the first planned city of India. 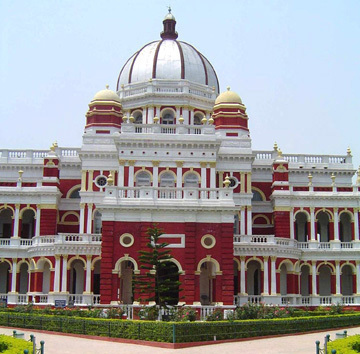 Located in the North of West Bengal, Coochbehar is truly a window to the far eastern states of India. To travel to the north eastern states of India, one has to pass the small sleepy town of Coochbehar. 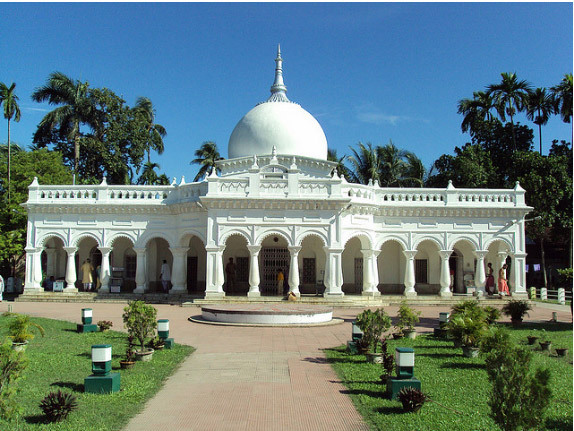 While the district of Jalpaiguri lies in the north and the state of Assam in the east, Coochbehar shares an international border with Bangladesh in the south. With a brief spell of summer and heavy rainfalls during the monsoon season, Coochbehar enjoys relatively pleasant climate throughout the year. 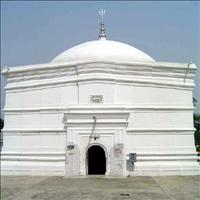 A fine example of 17th century Bengali temple architecture, the Kamateshwari Temple is a major attraction in the town of Gosanibari. Nearly 37 km. from Coochbehar, situated at a distance of about 8 km west of Dinhata railway station, original structure of the temple got destroyed. Nonethless, the present structure is also nearly 300 years old, built by Maharaja Pran Narayan in 1665. Dedicated to another incarnation of Goddess Parvati, inside the temple the throne of the goddess can be seen. This more than a century old ancient golden-domed temple is one of the main attractions of Coochbehar. It stands on the north bank of Bairagi Dighi, a large lake situated in the heart of the Coochbehar town. Built in 1889 by Maharaja Nripendra Narayan, the structure of this temple is in Charchala style of Hindu architecture. Inside the temple is an idol of Madan Mohan, an incarnation of Lord Krishna and the royal deity. The idol made of gold and ashtadhaatu, an alloy of eight metals, is nearly 200-year old. The other deities include Ma Kali, Ma Tara and Ma Bhavani. Situated at a distance of about 10 km north of Coochbehar town, is an ancient temple dedicated to Lord Shiva, known as the Baneshwar temple. The temple is reputed to date back to 1100 B.C. and has a Shiva lingam 10 feet below the plinth level. 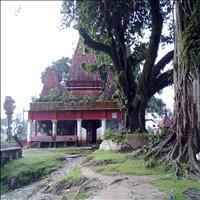 By the side of the main temple is another temple which has the idol of Ardhanarinateswar. On the occasions of Madan Chaturdashi and Dol Purnima this idol is carried temporarily to the Madan Mohan Temple of Coochbehar town, which has given the name of Movable Baneshwar. There is a big pond within the temple campus having a large number of tortoises. Some of the tortoises are very old and big in size and can be fed with puffed rice. The most important landmark of this ancient princely state that stands regally is the magnificent Raj Bari or the palace of the kings. A bit outskirt from the main city, this huge structure looks even larger from the outside because of its spread eagle shape. Designed by an English architect, who was the favourite among the royalties of Kolhapur, Mysore and Baroda, the palace was built in 1887. Built in Italian style of architecture, this building is a near-replica of the St. Peter's Church in Rome. The interior of the royal palace, especially the Durbar Hall, is a visual treat. The entire palace is furnished with exclusive items of furniture, brought from all over the world. Covering a vast area of around 4,766 sq. meters, this palace has been recently renovated and has been opened for public with museums displaying the artifacts used by the royalty. 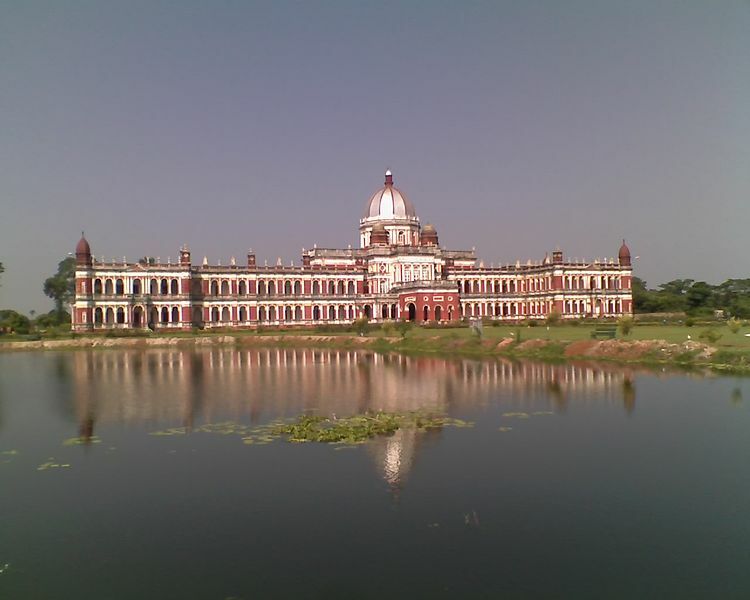 The kings of Coochbehar planned the city and built the administrative buildings around the huge lake called the Sagar Dighi. The Sagar Dighi is a huge tank which has been recently cleaned and cleared. A place for daily meetings and appointments, Sagar Dighi, is right in the centre of this small town. Boat rides and cool breeze around has made it all the more popular spot. \r\nMost of the buildings around here are still in use for administrative purposes. Built in brick and coloured in red, these buildings give a typical colonial administrative look. 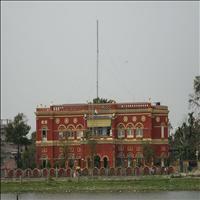 The District Magistrate or the D M building stands royally facing the Sagar Dighi. 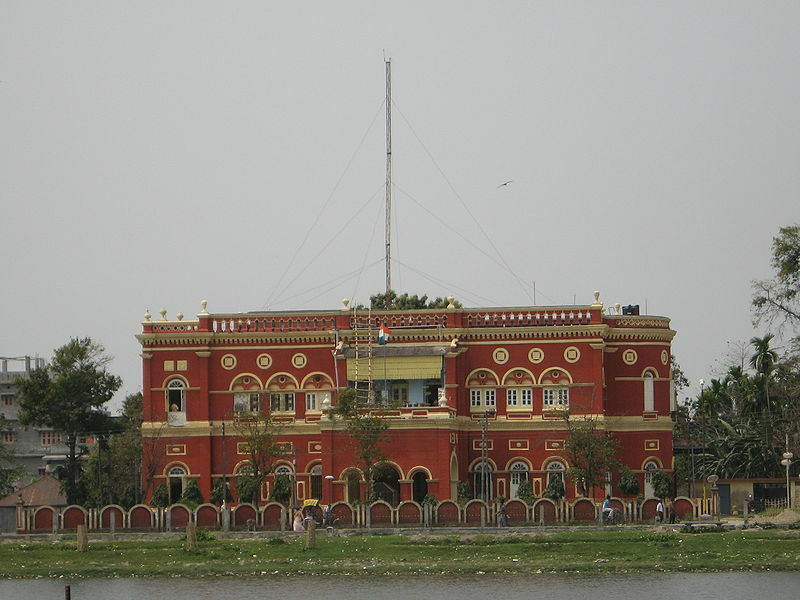 The Moti Mahal, the head Post Office building, the M J N Hospital building are all built during the 19th century. The 60 year old running MJN club and the Jenkins School, established in 1861 are premier institutions of India. Jalpaiguri is also a district of West Bengal, neighbour of the Coochbehar district and more famous for its Tea Gardens and as the doorstep to the northern state of Sikkim and the country of Bhutan. The district has dense forests and extensive tea gardens. Jute pressing, saw-milling and match manufacturing are the major industries. Popularly known as the Gateway to the Kingdom of Bhutan, the Buxa Duar Fort stands at a height of 867 meter on top of a hill on the India-Bhutan border. About 50 km from Coochbehar, this is a good overnight excursion. Though the Fort is almost destroyed now, it has strong historical associations. It fell in the hands of the British in 1864 by ousting its Bhutanese occupants. In 1930 the Fort was restructured in parts and was converted into a prison house. Many freedom fighters were kept confined here. Later the Fort also gave shelter to the Tibetan refugees who had fled Tibet with the Dalai Lama in 1959.\r\nToday some renovation is on with a project to set up a museum within the Fort complex being undertaken.\r\nThe Buxa Tiger Reserve has been set up around the Buxa Duar Fort. A part of the Chilapata Forests, it covers an area of 765 sq. km. The core area, however, occupies 304 sq. km. The Reserve is home to 67 species of mammals, including 23 endangered ones. According to the census, there are tigers, leopards, elephants, and a large number of wild boars, bison and many other animals. About 230 species of birds and innumerable butterflies add colour to the forest.\r\nThe Reserve serves as a vital linking corridor for elephants migrating between the forests of Bhutan in the north and the Manas Tiger Reserve in Assam in the east.\r\nTo the east of Kalimpong and bordering Bhutan are vast stretches of virgin forests and lush green countryside known as the Duars or The Gateway. Here, the turbulent Tista River and its tributaries flow through the foothills of the Himalayas. Home to several endangered species, the Duars terrain is filled with wildlife, nature and adventure. A must visit place to enjoy the nature’s bliss. The Jaldapara Wildlfe Sanctuary with an area of 216.51 sq km is a mosaic of woods, grassland, swamps and streams with great diversity of fauna and flora. It is located in the eastern part of Jalpaiguri district not far away from Coochbehar. The River Torsha runs through the Sanctuary. The forest is mainly savannah covered with tall elephant grasses.\r\nThe Jaldapara Sanctuary is home for the Great Indian One-Horned Rhinoceros. Herds of elephants can frequently be found using it as feeding grounds. Hog deer, spotted deer, barking deer and sambar are found, as are the Indian Bison. Tigers and leopards can be spotted too. There is also a leopard-breeding centre at Jaldapara. The Sanctuary is home for some rare species like the hispid hare, hog badger, wild boar and sloth bears are found here. A rich and varied avifauna is found here as well like the Crested Eagle, Pallas’s Fishing Eagle and Shikra. Jungle fowl, peafowl, partridges, the Bengal Florican and Pied Hornbill with Python, monitor lizards, cobras, geckos and about 8 species of fresh water turtles add to the beauty. 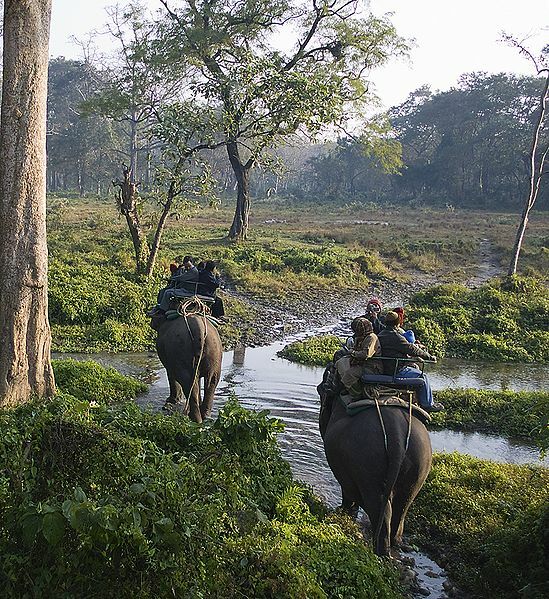 Besides wildlife viewing, there is scope for unusual holiday activities like elephant riding and leisurely strolls through the towering grass.\r\n Another major town is Siliguri. A crucial junction which is the doorway to North Bengal, Sikkim and Bhutan, it is also a major intersection in the road transportation network to north-east India.\r\nRapidly emerging as a new commercial hub, Siliguri owes its prosperity to the tea and orange trades. More than anything else, the major attraction of Siliguri in recent years remains its Hong Kong Market, a virtual Pandora's Box for foreign goods of all kinds.